An interview with Arzu Naghiyev, deputy director general of Trend news agency, political analyst, has been published by the Global Institute for Democracy and Strategic Studies (GIDSS). There were several important events that occurred in the South Caucasus over the past few days: a year has passed since the beginning of April clashes for Karabakh, parliamentary elections were held in Armenia on the same day, and President of Kazakhstan Nursultan Nazarbayev visited Baku the next day. The deputy director general of MIA ‘Trend’, political scientist, Arzu Nagiyev, discussed these events and how they are connected in an interview with Vestnik Kavkaza. 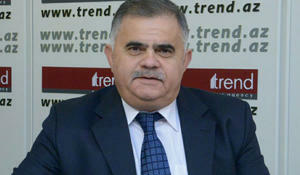 Despite the signs of US President-elect Donald Trump's willingness to maintain contacts with Azerbaijan, in fact anything will unlikely to change in Washington's policy on South Caucasus, Arzu Naghiyev, deputy director general of Trend news agency, political analyst, told Vestnik Kavkaza information and analysis agency. Recently, Azerbaijan celebrated the anniversary of its independence; on October 18th 1991 Azerbaijan's Supreme Council adopted the Constitutional Act on the State Independence of the Republic of Azerbaijan from the USSR. Vestnik Kavkaza spoke with a political analyst and deputy director of Trend Agency, Arzu Nagiyev, about the life of Azerbaijan in these 25 years.